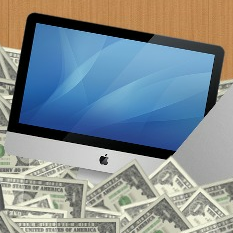 Starting up Mac OS X for the first time on your Hackintosh can be a very tricky process, which often requires you to set special boot options through the use of boot flags. For those of you who don't know, boot flags are "arguments" (pieces of data that you enter) to change the way that your bootloader runs. The bootloader is the program that boots Mac OS X. 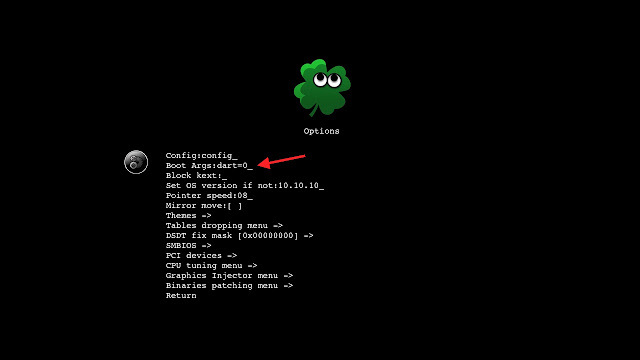 While we've already previously discussed how to use boot flags on the Chameleon and Chimera bootloaders, which were formally the two most popular bootloaders for PCs running Mac OS X, the release of OS X El Capitan has now shifted attention onto the new and upcoming Clover bootloader. 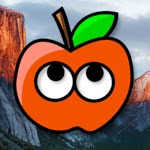 All Hackintosh installation methods for El Capitan, including tonymacx86's ever-popular Unibeast method, now use Clover. 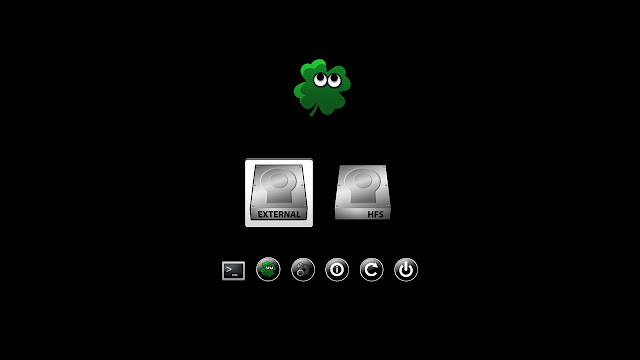 Unfortunately, using boot flags on Clover requires a slightly different technique than on Chameleon/Chimera (although most of the boot flags themselves remain the same). That's what this guide is here for. On Chameleon/Chimera, you could enter a temporary boot flag by simply typing it directly into your computer's bootloader menu. In contrast, the process is slightly more involved with Clover. Use the arrow keys on your keyboard to select the "Options" button at the bottom of the menu (if you used Unibeast, it'll probably be the button with the picture of gears). NOTE: There are technically two different options buttons-- one is for "Clover Options", while the other is just "Options." You want to choose "Options." Open up the Options by press Enter on your keyboard (or Return, or the spacebar). From here, use your arrow keys to select the "Boot Args" line. Press your spacebar, and then you'll be able to start typing the necessary boot flags. Press Enter when you're done. From here, return to the original Clover boot menu (you can press the "Esc" key on your keyboard to do this), and boot OS X again. Voila! If you need help finding the right boot flags for your Hackintosh, check out our list of common boot flags (this list is tailored for Chameleon/Chimera, but Clover supports many of the same flags). Once you've managed to boot into your Hackintosh, you'll probably want to make those boot flags permanent, so that they'll automatically be entered into the bootloader every time you start Mac OS X. This process is also a bit more involved in Clover, compared to Chameleon/Chimera. Traditionally, you could permanently enable certain boot flags by adding them to the text file "org.Chameleon.boot.plist," which was essentially the settings file for Chameleon/Chimera. Clover's settings rely on a similar text file called "config.plist." However, Clover's file may be a little bit harder to work with, depending on your particular setup. 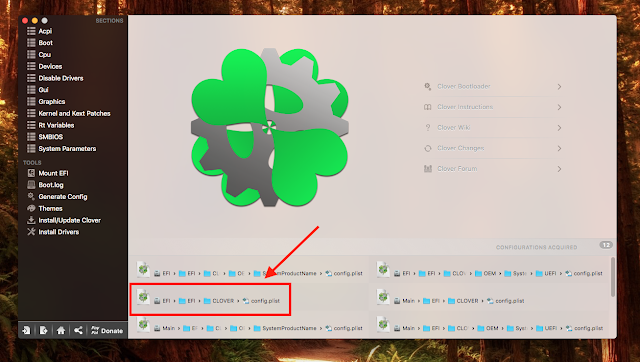 So instead of editing the file directly, like we did with Chameleon/Chimera, we recommend that you download the free Clover Configurator app instead. Once you've downloaded it, open up the Clover Configurator app (which comes in a ZIP file). The home page of the app will display some number of seemingly identical files named "config.plist," with the exact number depending on how many hard drives your computer has. Your actual "config.plist" file will be on your computer's EFI partition. To modify it, you first have to mount the EFI partition, which is usually hidden when you boot OS X. To do this, click on the "Mount EFI" button on the left column. 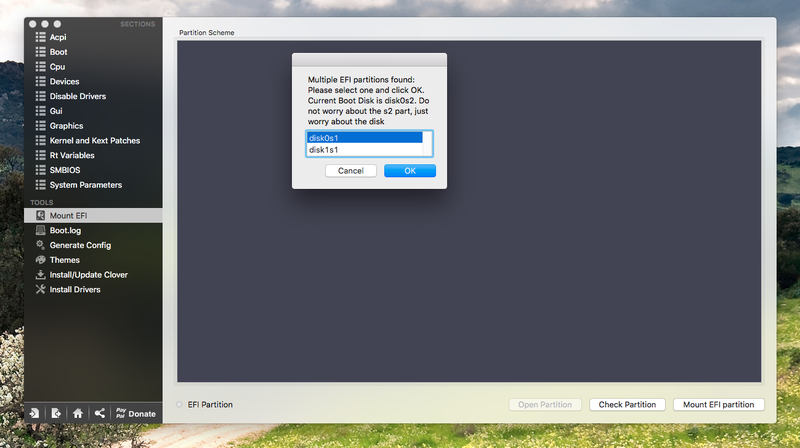 Then, in the page that comes up, click "Mount EFI partition." If you have multiple hard drives, choose the hard drive that OS X is currently booting from. In the screenshot below, Clover Configurator tells me that I'm currently booting from disk0s2, so I choose disk0s1 (because it's part of "disk0"). 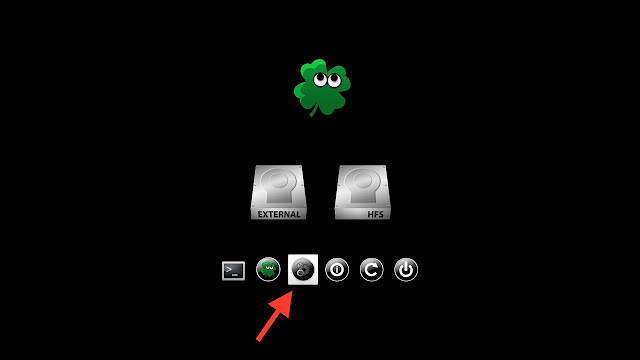 Once that's done, return to the homepage for Clover Configurator (by clicking the house icon on the bottom left), and click the "config.plist" icon that goes EFI -> EFI -> CLOVER -> config.plist. 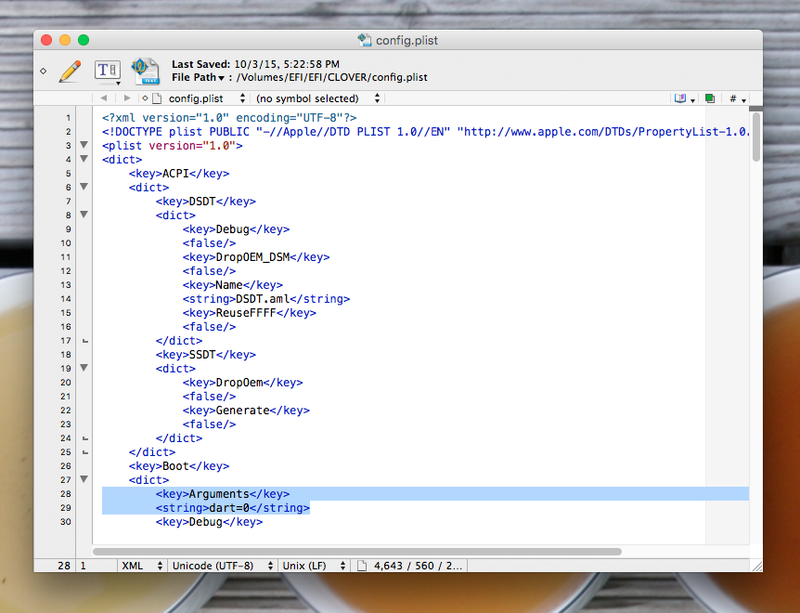 Once you've selected the appropriate config.plist, a new Clover Configurator window may pop up. Click on the "Boot" tab of that new window. 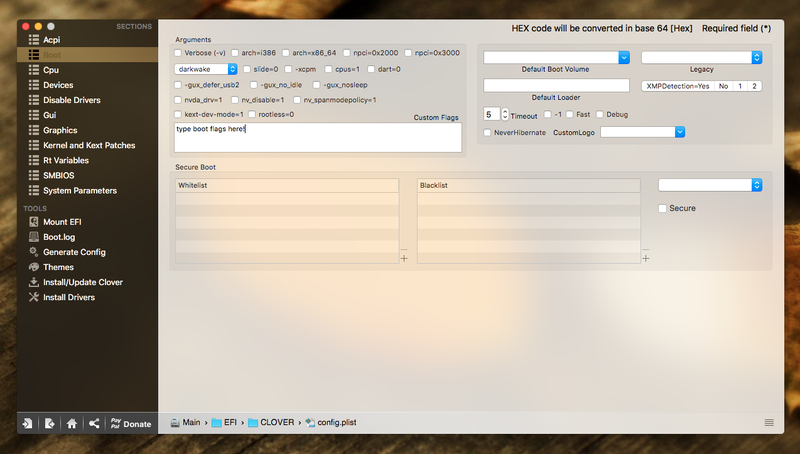 From here, you can select and de-select common boot flags, as well as add your own! That's all you need to do to apply a boot flag for your Hackintosh. 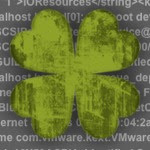 (Any changes made in Clover Configurator usually save automatically.) Once again, if you need help finding the right boot flags for your Hackintosh, check out our list of common boot flags.